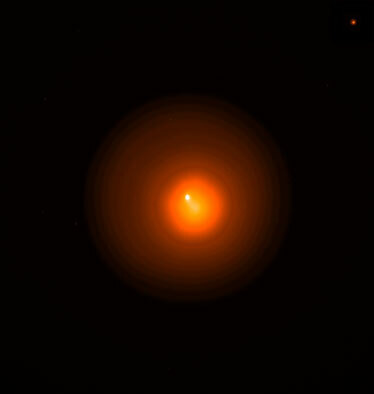 The Holmes comet, shown here in a colorized image, is undergoing an eruption of material that has astronomers seeking a cause. The bizarre burst of material from Comet 17P/Holmes in the Perseus constellation is "just awesome," says University of Hawaii astronomer David Jewitt. "What we see is very, very weird," he said yesterday. Astronomers worldwide are studying the comet, which is a million times brighter than it was a few days ago, Jewitt said. Small outbursts occur in comets, which might fluctuate in brightness by a factor of two, he said. "But an outburst by a factor of a million is staggering, and I don't know of a previous case like this. "It is simply a unique event in the modern era," added Jewitt. He and his colleagues are trying to get an understanding of what is causing the erupting material and what it means for the evolution of comets. He spent Thursday night at UH's 88-inch telescope on Mauna Kea observing the event with Institute for Astronomy postdoctoral researchers Pedro Lacerda, Jan Kleyna and Nuno Peixinho and graduate students Rachel Stevenson and Bin Yang. The comet has ejected "an almost perfectly circular shell of material" that is quickly expanding, Jewitt said. "It was expanding measurably over the course of observing." Its bright orange and red colors represent the intensity of the material reflected by the sunlight as it is ejected from the comet's nucleus, he said. He suspects a white dot showing up on the photographs could be the nucleus, but he is not sure. UH planetary astronomer Dave Tholen cited three possible reasons for the rare outburst. The comet could be splitting into pieces, he said. Or it could have had a collision with a random small rock, which is a remote possibility, he said. He thinks the more likely cause has something to do with the sun's heat penetrating icy material deep in the comet's interior, causing it to start sublimating and increase in brightness. A comet is like a teapot full of water heating on the stove, Tholen explained. "Eventually, the heat turns the water into gas, pressure builds up and forces the lid to open and it will whistle." Gas pressure inside the Holmes comet could have built up to where it fractured the surface and allowed material to escape, he said. "We don't know yet." The Perseus constellation is on the northeastern horizon at sunset, Tholen said, adding that the best time to see it is about 2 a.m., when it is high in the sky. Jewitt said, "To have the comet well placed in the sky and visible for months, even to the naked eye right now, is kind of mind-blowing." A similar outburst more than 100 years ago led to the discovery of the Holmes comet, he said. "How many of these can it do before nothing is left?" He plans a program of observations to measure the mass of material blowing out of the comet and see what happens over time. "Has it just blown out material impulsively, a big burst of material, or has it turned on a spigot and material will just keep flowing for a long time?" If it is a one-time event, it should get fainter, he said. If it is a vent opening, it will be like a volcano, with stuff coming out for weeks, months or longer. The comet is about 100,000 miles in diameter, compared with Earth's 8,000-mile diameter, Jewitt said. "It sits inside our view of the camera (on the telescope), but the shell is expanding and will spread out of our view," he said.